This section covers the period between Wilder Penfield's first year of undergraduate studies at Princeton University in 1909 and his postgraduate research and training at the National Hospital for Nervous Diseases (Queen Square) in London during 1920 and 1921. At Princeton he excelled at football and, while initially hesitant at the idea of following in his father's footsteps, was eventually inspired to study of medicine by his biology professor. 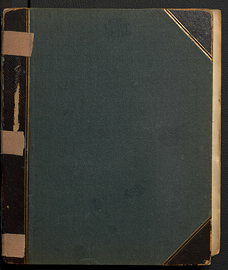 Penfield's period at Princeton is documented here by several class reunion photographs, as well as by a portion of a scrapbook/photograph album covering the years 1913 to 1916. Penfield received a Rhodes Scholarship in 1914 and started his Oxford studies at Merton College the following year. The photographs in the 1913-1916 album record his travels, the beginning of his physiology and eventual neurocytology training under Sir Charles Sherrington, his anatomy courses at Oxford and Edinburgh, and his friendship with Oxford's Regius Professor of Medicine, Sir William Osler. Two more albums, one titled Sussex Album and another covering 1919 to 1927, document Penfield's volunteer work at hospitals in France during the First World War and his injury en route to France in 1916, as well as his recuperation under the care of the Osler family. 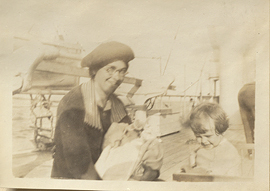 The 1919 to 1927 album also includes photographs of Penfield's return to Oxford with his young family for graduate research in Sherrington's lab in 1919, his additional graduate work in London, and his eventual move to New York City and Columbia University's Presbyterian Hospital in 1921. 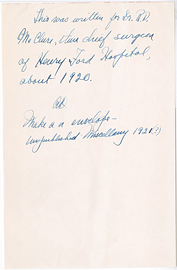 Evidence of Penfield's time at John's Hopkins University Medical School, from which he obtained his MD in 1919, is found in a handwritten note book that contains observations of the surgical techniques and apparatuses of Harvey Cushing at the Peter Bent Brigham Hospital in Boston, where Penfield was a surgical intern in 1919. 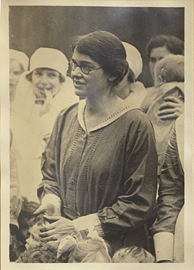 The notebook also contains photographs, diagrams, and notes made by Penfield while volunteering at the American Red Cross Hospital in Paris during 1917 and 1918. His time in Paris is also evidenced by a collection of postcards. 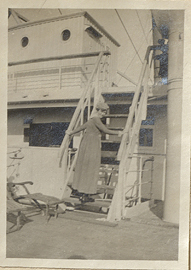 Kermott Penfield posing on stairs of the S.S. Winifredian, photograph. "British State Medicine." Article by Wilder Penfield, ca. 1920. 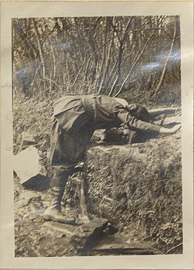 1913-1916 photo album of Wilder Penfield. 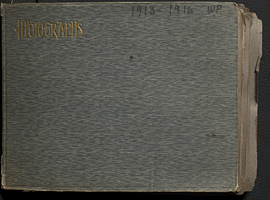 1919-1927 photo album of Wilder Penfield. 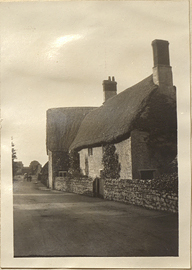 A Cottage in Wytham, photograph. 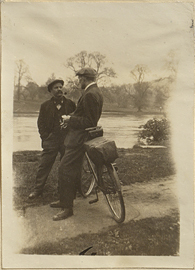 A Stop in Lydbrook, photograph. 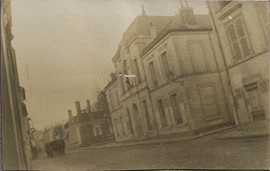 A street in Ris Orangis, France, photograph. 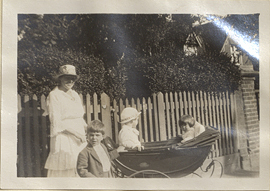 A woman, three children, and a baby carriage, photograph. 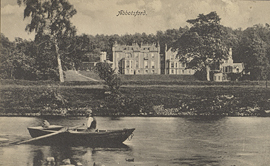 Abbotsford from the banks of the River Tweed, postcard. 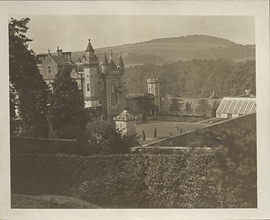 Abbotsford, Home of Sir Walter Scott, photograph. 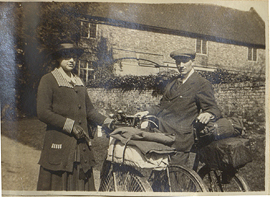 Abigail Adams Eliot and Wilder Penfield with Bicycles, photograph. Abigail Adams Eliot on a Stone, photograph. Abigail Adams Eliot with Ruth Mary Penfield and Wilder Penfield Jr., photograph. 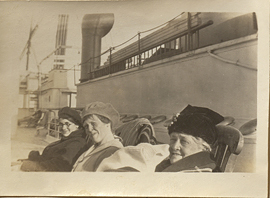 Abigail Adams Eliot, Helen Kermott Penfield, and Jean Jefferson Penfield sitting on the deck of the S.S. Winifredian.